International growth in body cameras could be TASER International, Inc.'s biggest opportunity right now. TASER International (NASDAQ:AAXN) has had a lot of wins in 2016, expanding the number of less lethal weapons and body cameras in the field. Law enforcement agencies around the world are starting to realize the value the company can provide, and big contracts are coming in as a result. One contract win in particular sticks out as a sign of the company's success and promising future. And it doesn't come from a major U.S. city where body cameras are starting to be a standard device for officers. It comes from half a world away. On July 20, TASER International announced a contract with the Queensland Police Service in Australia for 2,200 Axon Flex cameras, adding to the 500 Axon cameras already in the field. A three-year subscription to Evidence.com was also added to augment the camera purchase. This was a big order on its own, bigger than the 2,031-camera order from the Chicago PD this year. What makes it truly impressive is that it's an international buyer and it includes Evidence.com cloud services. This is really the convergence of two goals for TASER International. It's been investing in R&D to improve product offerings in body cameras and the cloud, but it's also been investing in a sales team to grow sales internationally. You can see below that investment in both categories has been growing faster than sales in the last three years, and contract wins like this are a sign that the investment is paying off. What needs to take place in the next few years is a leveling off of R&D and sales expenses, allowing revenue to catch up to previous investments. That will allow net income to grow. The Queensland deal is emblematic of sales TASER International has been making in the last year or two. 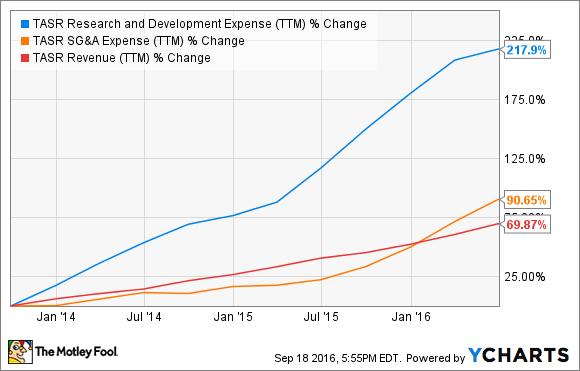 Axon body camera sales make an immediate impact, but long-term the real profitability will come from Evidence.com cloud data storage. Future revenue booked from Evidence.com and Axon body cameras stood at $262.8 million at the end of the second quarter, and I recently highlighted that the profit potential from the future revenue is incredibly high. If international sales grow as a percentage of overall sales, the R&D expenses can be leveraged over a larger customer base. And the sales organization can be expanded across the globe to areas where there's a market fit. Long-term, that will drive higher margins and greater profitability.